Pregnancy rumours about celebrities are frequent but seem to be particularly strong in relation to Aniston. 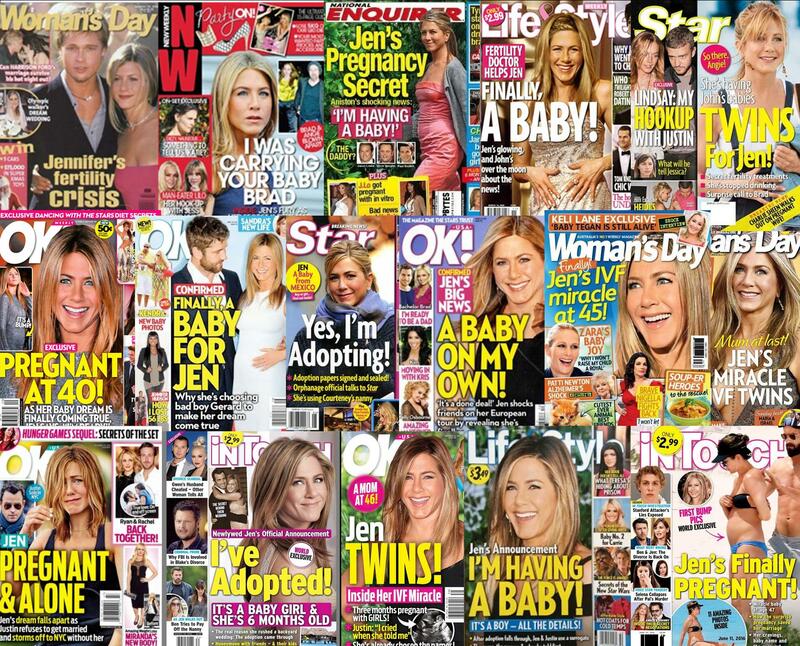 A sample of magazine covers featuring Aniston show that the rumours about her becoming a mother range widely in scope: relating to different partners as well as becoming a single mother, claiming Aniston is to become a mother via heterosexual conception as well as via IVF, surrogacy, and adoption, claiming Aniston is pregnant with twins on numerous occasions, and reporting on rumoured miscarriages and fertility issues. The idea that women without children feel incomplete was a theme in our interviews with intending parents. Pronatalism was naturalised through a comparison with ‘unnatural’ childless others. In other words, participants discussed either people they knew or abstract others without children as ‘selfish’ or ‘odd’ in order to bolster or naturalise their own desire for children. The ways in which pronatalism is intergenerationally transmitted was also a feature of our interviews, in both subtle and not-so-subtle ways. As we wrote about in our previous blog post, our participants experienced pressure to have children from their own parents. However, Aniston’s argument that every woman should make her own ‘decisions’ about marriage and motherhood ignores that not everyone can necessarily resist normative expectations. Furthermore, Aniston’s extremely privileged position in terms of finances and influence mean that for her having children is not bounded by the same limits as most people. Similarly, while we are critiquing pronatalism, we are careful not to suggest that everyone has a ‘choice’ in terms of parenthood, where everyone has the same capacity to choose. Becoming or not becoming a parent is often made up of a range of factors extending beyond ‘choice’ for many people, possibly including issues relating to careers, fertility, finances, partners, living arrangements, and so on. We are already in the second year of our study, and we are currently doing interviews with participants who are now pregnant, and soon we will start interviewing participants who have given birth. We have also been interviewing the parents and grandparents of our participants, in an attempt at understanding intergenerational accounts of having children. One of the key things that has come up time and time again in our interviews is the expectation that heterosexual couples will have children. Many of our participants – both men and women – have spoken to us about the questions that were asked of them in regards to having children, often as soon as they were married or when they started living together. A consistent finding of our research is the normative expectation that children constitute part of a heterosexual relationship life course. Although for some of our participants the questions asked of them by family members with regard to fertility planning were light hearted, for many there was considerable pressure placed upon them to have children. Whilst potentially a world away from the lives of our participants, the current season of Real Housewives of Melbourne shows a similar experience of one of the women – Jackie Gillies. In the second episode of season three we see Jackie and her husband Ben receive a visit from Jackie’s mother. The purpose of the visit, we learn, is for Jackie’s mother to ask when they will be having children. Just as was the case for Jackie Gillies, many of our participants situated the demands placed upon them to have children in a range of contexts: particular cultural expectations, others’ perceptions that our participants love children (and hence should become parents), and the ever-looking ‘biological clock’ (the latter concern also expressed by Jackie Gillies). Whilst these are relatively common narratives used to justify questions about fertility planning, our broader interest is in how others’ expectations potentially play a significant role in the decisions that some heterosexual couples make about having children. Certainly some of our participants have resisted the pressures they have experienced, and others have spoken back to those attempting to pressure them. In the episode of Real Housewives, Jackie certainly speaks back to her mother. Yet like most of us, there is a clear tension between resisting the expectations of others, and the ways in which such expectations can creep into our thinking, subtly influencing the decisions we make. Part of our interest in conducting this study was to explore how heterosexual couples make decisions about having a first child. Many of our participants have, at times, struggled to describe precisely what has led them to decide to have children now, with many participants resorting to the language of ‘natural’ or ‘innate’ to describe their desire for a child. A focus on the pressures that others exert, however, adds another dimension to the story, suggesting that the normative expectations of others can play a significant part in both the decision to have children, and the time at which this occurs. We’ve nearly completed the first round of interviews with heterosexual couples, exploring the emotions and motivations associated with planning for a first child. Notable to us was the fact that in all cases, we were contacted by the women in the couples first, who were often keen to participate. It was a requirement of the study for both members of the couple to participate. While several of the men were also keen to take part and learn the findings from the study, some were less invested in being involved, although they still shared a lot during the interviews. Members of each couple were interviewed separately to explore their views and feelings in depth. Existing research suggests that individuals within couples are likely to have different investments in and desires to have children, and thus participants were able to talk more freely without the presence of their partner. We suspect this turned out to be an important decision, given that, for the most part, men spent more time thinking about their responses before speaking, and needed more follow up questions than women. If both members of the couples were present it would have been difficult to explore all of the questions in the same depth with the women and the men. During the interviews it became apparent that, for the most part, women talked for longer and with less prompting than men. This was the case even for one man in particular who had a lot to say but seemed to be able to talk more when prompted than when responding to the initial open-ended question. In contrast, the women generally responded in more depth to the open-ended questions, although were still asked to elaborate on their answers. These gender differences prompted Clare, as the person doing the interviewing, to adapt her interview style to mirror to a certain degree the interactional styles of the men she interviewed. Whilst this was of course true for all participants, it was most noticeable to Clare in regards to the interviews she conducted with men. An example of adapting involved asking men more prompting questions than women in order to draw out more responses. This included asking questions like ‘could you expand on that a bit?’ or ‘could you tell me a bit more about that?’ or asking specific questions in relation to the content of their responses. This approach was productive, as evidenced by the fact that towards the end of some of the interviews some men were ready for a prompting question and, after giving a short answer, would immediately ask if Clare wanted them to elaborate. The context of the interview setting also seemed to occasionally interfere with how much men spoke. In particular, one of the men chatted much more freely once Clare had turned the audio-recorder off at the end of the interview. As a final note, it’s important to recognise that the topic itself was one which many participants may have not reflected on much prior to the interviews. Previous studies about desires and motivations to have children have tended to focus on people who face challenges to becoming parents because they cannot have a child via sexual reproduction for social or medical reasons. By necessity, such couples have undertaken a significant amount of reflection and planning in attempting to become parents. In contrast, having children via reproductive heterosex in the context of a relationship is to a certain degree more straightforward (though some of our participants challenged the normative assumption that reproductive heterosex is ‘easier’). Thus, it was also important to acknowledge to participants that some of the questions might be hard to answer. In the upcoming second interviews when women are 6 months pregnant and the idea of becoming parents is more tangible, we anticipate that the participants, and the men in particular, will be able to talk and reflect more on their feelings associated with having a child. Interviews are well under way for our first study, focusing on first time parents. This study will track a group of South Australian heterosexual couples planning for a first child, beginning with their journey to becoming pregnant, their experiences of pregnancy, and their experiences after the birth of their child. Going into this study, we had presumed that there would be many people interested in participating. Data from the Australian Bureau of Statistics indicate that over 20, 000 children are born in South Australia each year. Whilst not all births each year are a first child, Australian Institute of Health and Welfare data indicate that a little over 40% of all births each year are first time births. As we came to advertise the study, we realised that many of the outlets that target families with children focus on people who already have children. Our challenge, then, was to try and reach people who were planning to have children, but had not yet become pregnant. We advertised in local media, community newspapers, on Facebook, Twitter, and on a range of forums that focus on parents and babies. What was surprising to us was that over 2000 people visited our website in the space of a month, but far fewer made contact to participate in the research (which was probably a good thing, as interviewing 2000 people might have taken us a long time!). We have spent a lot of time talking about what the barriers might be to people actually making contact with us and participating in the study. One barrier might be that people in the planning stage might be concerned about what lies ahead, and might not want to jinx things by talking to us before they are pregnant. Another barrier might be that the people who have seen our ads and visited our website are not eligible (given we are looking for people who are not yet pregnant). All in all, we have been very happy with the response we have had, though we are happy to hear from any additional people looking to participate. It has been a great learning exercise for us in terms of recruitment. We went into it buoyed by the figures above and believed that, in focusing on a majority population (i.e., heterosexual couples), we would very quickly reach our quota. Having to think outside the box in terms of widening our search parameters and exploring new ways to reach potential participants has, if anything, increased our commitment to the study and encouraged us to continue to reflect on the assumptions we bring to participant recruitment. Later in 2015 we will be making an announcement about our call for participants for a second study, focusing on experiences of parenting across multiple generations. Are you planning to have children within the next year? Researchers at Flinders University are currently undertaking a project focusing on the desires and motivations of heterosexual couples who are planning to have children. Participants will be involved in four interviews about their experiences of wanting and having a child. These will occur 1) at the point in which the couple are attempting to become pregnant, 2) during the pregnancy, 3) 6 months after the child is born, and 4) 18 months after the child is born. The sharing of experiences related to planning for and having a child is intended to be enjoyable for participants.Members of each couple will be interviewed separately at each stage of the research. Interviews will take place at a location convenient to participants. Please contact Dr Damien Riggs via email (preferred): contact@australianparentingstudy.com or phone: (08) 8201 2786. The research has been approved by the Flinders University Social and Behavioural Research Ethics Committee (Project Number 6694).